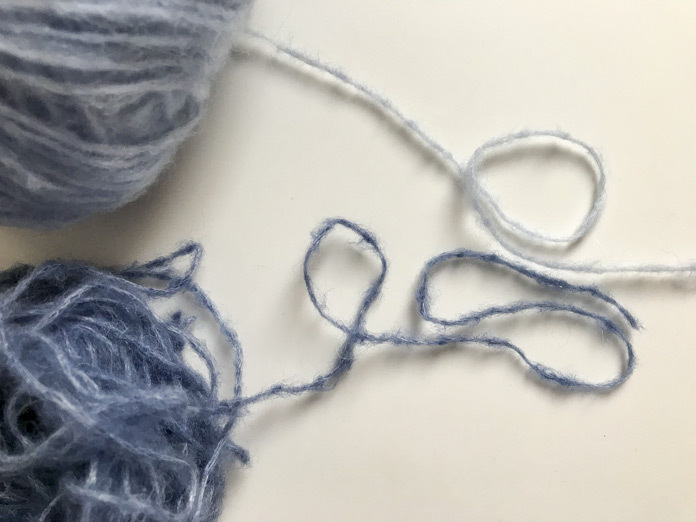 Welcome to this week’s posts on KNITmuch where I’ll be exploring Rozetti Yarns Alaska – a light and airy yarn that surrounds you with warmth and softness. When I was first introduced to Alaska, it softly whispered “touch me”. I was not disappointed, as it is as soft on the hands as it appeared to be. The type of softness that makes you squish it up to your neck, the true test of softness. The 8-color palette is equally soft with color names like Icicle, Peach Puff, and Frozen Pond to name a few, that are representative of an Alaskan powder puff. When I read the label, there were several things about it that surprised me. One of which is the gauge. The yarn is rated as a DK/Light Worsted (3) with a recommended needle size of US 5 [3.75mm] to achieve a gauge of 20 stitches and 26 rows over 4” [10cm]. As a gauge knitter, I would typically expect to achieve this for most yarns with a US 7 [4.5mm]. Another pleasant surprise is the yardage. A 50g ball contains a generous 246yds [225m], which is what you would typically expect from a 100g ball of light worsted. This speaks to the lightness and airiness of the fiber. The fluffiness of the yarn gives it an aura. The fluffiness of the yarn gives it an aura, making it difficult for the eyes to focus on an individual strand. Alaska is comprised of 44% Acrylic, 15% Alpaca, 15% Super Wash Fine Merino, and 26% Polyamide. Although there is a high synthetic content, the most delicate of the fibers, in this case Alpaca, dictate the laundering requirements. The recommended laundry care is hand wash, lay flat to dry, and no iron. 4) Do I like wearing the finished project. Items 1 and 2 have been answered positively for me, and the balance of the week will focus on items 3 and 4. Join me tomorrow, I’ll knit some swatches, and then proceed with projects for the remainder of the week. 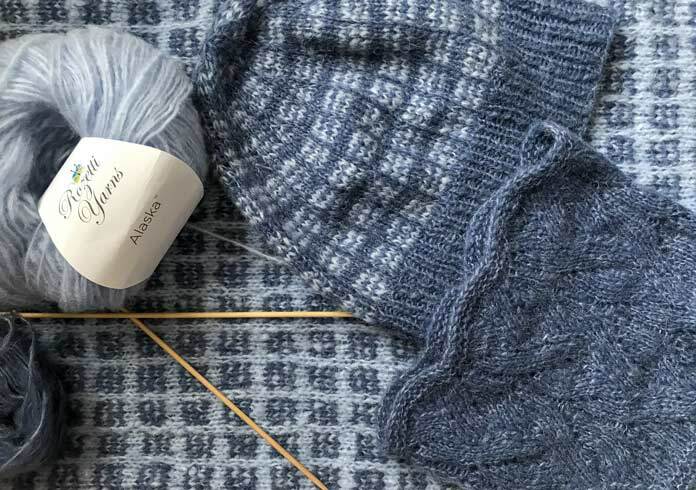 As Alaska is relatively new, there are only a few patterns designed specifically for this yarn. The Choux Cowl, a free pattern, is one of them. This week, I have elected to make this cowl, along with a hat to match, and a lacy accessory to complement the ensemble. I chose to use Frozen Pond and Stormy as my project palette as I envisioned wearing the finished projects with my comfy blue jeans. These are the projects I worked on for you this week: a toque, a small lacy cowl, and a larger cowl. 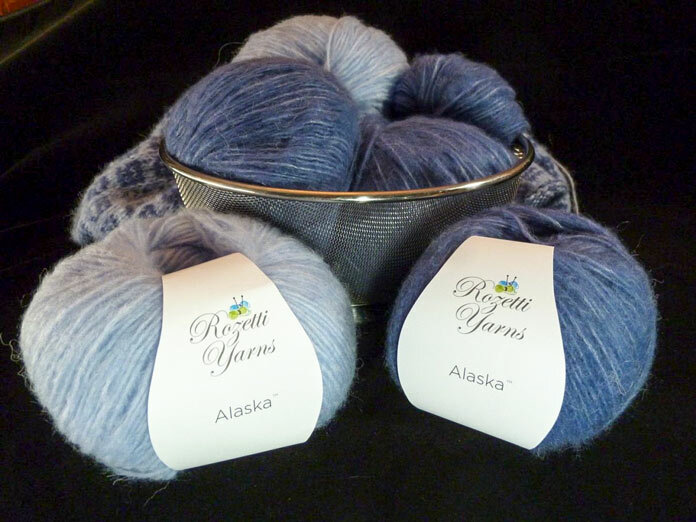 They are knitted using Rozetti Yarns Alaska, so soft to the skin and warm. Stay tuned.